The Centurian says to Jesus, "Just speak the word, and my servant will be made well." FTER HEALING THE leper, Jesus returned with his disciples to Capernaum, where he had healed so many sick people at the close of one Sabbath-day. News of his coming reached the city before he arrived, and his friends were glad to hear that he would be with them again. Other people besides those who knew him were glad to hear of his coming. One of them was a Roman, called by the Jews a "Gentile," because he did not belong to the Jewish nation, or race. All people who are not Jews are called Gentiles, and this Gentile was captain of a band of one hundred Roman soldiers. He was called a centurion by those people; but we should call him a captain. This captain, or centurion, was friendly toward the Jews. He treated them kingly, and was never rough to them.. He even built for them a synagog, perhaps the very one in which Jesus had often taught the people on the Sabbath-days. And because of his kindness to them the Jews respected him although he was a Roman Gentile. One day a servant of the centurion became sick. On the next day he grew worse, and soon it seemed that he could not live much longer. 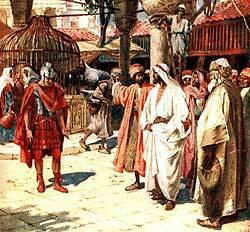 The centurion loved this servant and grieved because he was ill. Then news came that Jesus had returned to Capernaum. Now, the centurion had heard about the sick people whom Jesus had cured, and about the evil spirits which Jesus had driven out of people's hearts. He knew Jesus could heal his servant, but he felt too unworthy to go to Jesus and ask him to do this. He was a Roman, and he knew that Jesus was a Jew. Perhaps he thought Jesus might not be willing to listen to the request of a man who belonged to another nation. He knew about the race-pride of the Jews, and how the religious Pharisees and the scribes despised the Gentile Romans. He may have feared that Jesus would not be quite willing to heal his servant because he was a Gentile. But he loved his servant very dearly and he was willing to try some way to have Jesus come and heal him. So he called for the Jewish teachers in the synagog which he had built, and told them to go to Jesus and ask him to heal the sick man. And they gladly went. When these Jewish teachers, or elders, came to Jesus they told him about the centurion's desire that he would come and heal the servant. They told him also about the kindness of this Roman captain, and how he had built their synagog. "He is a worthy man," they said; "for he loves our nation." And Jesus went with them. As they were nearing the centurion's home they saw some men coming to meet them. These men were friends of the centurion, whom he had sent to tell Jesus that he need not come into the house to heal the sick man. The centurion did not feel worthy to have such a great person as Jesus enter under the roof of his house, and he felt himself too unworthy to go out to meet Jesus. So he had sent his friends to carry his message to Jesus. And this was the message: "Lord, do not trouble yourself to come into my house, for I am not worthy to receive so great a man as you are. Just speak the word, and my servant will be made well. I know you have power to command sickness to depart, just as I have power to command my soldiers to obey me." When Jesus heard these words he was greatly pleased. He turned about and spoke to the curious people who were following, hoping to see another miracle. He said to them, "Nowhere among the Jews have I found such great faith in me as this Gentile captain has shown." Then he told the friends of the centurion that the servant would be made well. When they returned to the house they found the servant healed. And they saw how great was the power of Jesus to heal the sick, even when he did not come near to the place where they lay.